October and the sun have arrived, not happy about the October part, but sure glad to see the sun! With our show season now over, we plan on taking full advantage of the nice fall weather and going for a long trail ride this weekend. It has been a very busy and exciting summer for our members. All the rain made if difficult to get our hay crop in but it could not dampen our enthusiasm! Thank you all for sending me the information on how your summer was, everyone is always welcome to share news, just email me or Ronni with updates and we will be happy to share it in our newsletters. Congratulations going out to Henry and Nicole Gauthier, LP Cool Invitation went Reserve in the CCF Early Weanling Futurity at Amberlea. He is sired by a son of Special Invitation and out of an Olimpicool daughter. Diana Nordal and Silent Sams Pride also had a great show at Amberlea and came home with Hi point Novice Youth. Diana and Sam also won High Point Light Horse at the Nokomis SHF show this past summer. This year the show had 75 plus entries so that is a fantastic accomplishment. On the topic of Open shows, our youth coloured the ring all over Saskatchewan doing very well in both SHF and 4-H shows. At Saskatoon Prairieland Junior Ag Showcase 4-H show, Taylor Gardner and Mr. Sylvester won Hi Point Intermediate, and Melissa Miner Won Hi Point Senior on A Shady Investment. At the Youth Equestrian Tournament two of our youth did very well Taylor and Mr. Sylvester were reserve in the Mane Meltdown Hunt Seat Equitation and Audra Cooper and Clayboys Sassy Girl were Western Equitation Champions, and Reserve Western Performance. Audra and Sassy won the Hi Point Paint Horse blanket that the SPHC sponsored. As youth director I could not be more proud of these hard working dedicated youth. Still on the topic of youth, The Harvest of Colours show had another huge youth turnout, some missing from the photo. Between showing our horses we had some fun time together, we did a bubble gum blowing contest, a colouring contest and again this year we had a stall decorating contest. On Sunday the marshalling area had bubbles floating everywhere as we all took time to just blow bubbles! Our leadline classes had 3 of the most adorable upcoming riders showing us all their riding skills; they almost enjoyed the class as much as the crowd did watching them. Our Hi Point Novice Youth and Hi Point 13 and under was Taylor Gardner and Mr Sylvester, Hi Point 14 to 18 was Melissa Miner and A Shady Investment. The Harvest of Colours Show was held again this fall at Praireland Park in Saskatoon. The weekend unlike most this summer was sunny and warm setting the tone for a great year end show. Exhibitors commented on how well the show ran and the stands had lots of spectators all weekend long. The show committee and all our volunteers deserve a huge pat on their back; you all put on a fantastic show! Our other Hi Point awards are as follows, Novice Amateur and Amateur were both won by Janene Moch and Classi Special Dee. Junior Horse was Chips Black Tye, Loni, Chris, Michelle Larsen. Senior Horse was Mr Sylvester Taylor Gardner, Timed Event Horse was Turbo Injection ridden by Cheyenne Pasmeny. This year’s Solid Paint Bred open horse was PP Blackasnight I Am, shown by Mary Ann Tourangeau. Our Hi Point Walk Trot rider was Kata Robinson riding Starburst Danny and our Halter Champion of Champions was I’ve Got Revenue shown by Jackie McCarthy. We would very much like to thank our sponsors for making the 2010 show year a huge success. Sask Tel, Hillview Paint & Quarter Horses, Lakeland Veterinary Services, North Battleford, Carpet Superstore, North Battleford, Katawasin Performance Horses, Hyde Show Horses, Airdrie Trailer Sales, Superior Equine Feeds Ltd., Southend Tail Extensions, Sakakweyan Paints, Frontier Spay & Neuter Clinic, Marcel & Elma Rupert, Lynne Hoosier. 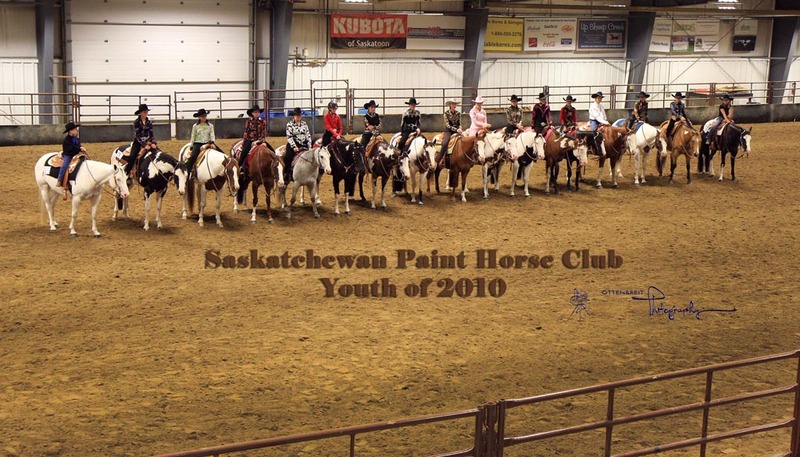 FUTURITY & STAKES RESULTS will be in our next newsletter, and are posted now on our website http://www.saskpainthorseclub.com/ and our Saskatchewan Paint horse Club facebook page. Enjoy your fall, happy harvest and make sure you slow down long enough to take the time to do what I am doing this weekend, go for a ride and enjoy that lovely Paint horse of yours.